While you are here be sure to check out our SillyServices! It's an electronic greeting card. It's a funny certificate. It's the perfect gift. It's a silly service! A customized online declaration and a place in our registry that you can share with your friends and loved ones! It's a perfect present for any occasion and it looks great on your MySpace, Facebook, website or digital picture frame! Now in two design styles! 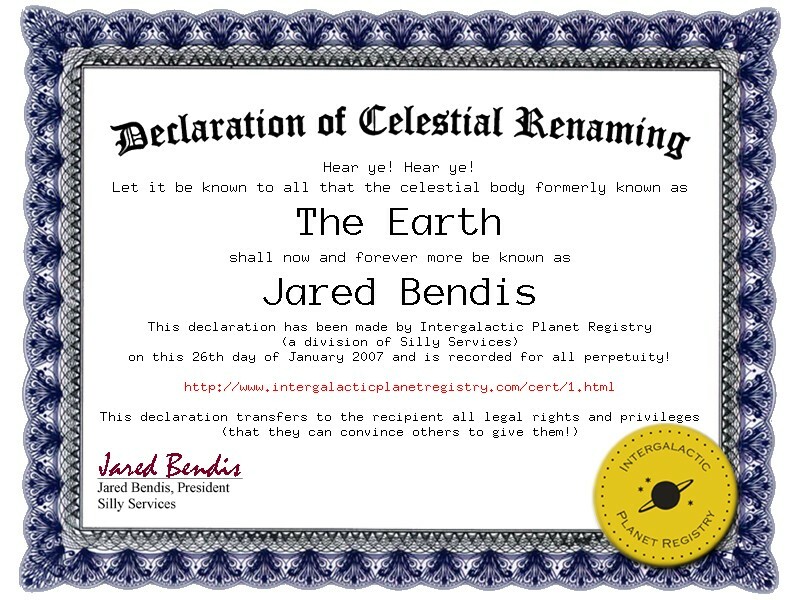 At the Intergalactic Planet Registry we rename planets after your friends and loves ones and create an 'official' Declaration of Celestial Renaming. Is there a special Princess or Queen in your life? At I Should Be King we can make you King with our 'official' Declaration of Royal Standing. We can make you king of your castle, street, neighborhood, or even the entire city. University of Silly, the finest non-accredited virtual university on the Internet, is now offering Bachelors, Masters, and PhDs in Silly! It's the silliest degree you will ever order! You can even get your own University of Silly T-shirt! Stock market got you down? Well order a Share of the Internet and you get the satisfaction of owning a non-transferable and completely worthless piece of the Internet that's 100% yours! Guaranteed to keep its lack of value! At Certified Emotion we let you put your money where your mouth is and put those emotions in writing. So go ahead and declare your Love, Like, or even Hate with an 'official' Declaration of Emotion. At Donation in Your Honor we give you all the job and pride of donating to charity without the costly expense! So pick from one of our many 'Not So Worthy Causes' and get yourself an 'official' Donation in Your Honor certificate. At Intergalactic Real Estate we don't just rename the planets - we sell the entire thing! Imagine giving your friends and loved ones an 'official' Declaration of Celestial Ownership. Do you have any famous relatives? Do you want some? At Fake Genealogy our crackpot team of investigators will discover that you are related to some famous historical figure. Who might it be? Who would you like it to be? Do you think you've been here before or know someone who has? At the Reincarnated Registry we validate claims of reincarnation with an 'official' Declaration of Reincarnation. You have the mug, you have the trophy, now order the 'official' Declaration of World Class Standing in your area of choice. World's best Mother! Word's worst Golfer! At Worlds What? you can be the best or the worst - you decide! Silly Services is a very real company offering very silly services. We feel that there are just not enough silly services in the world and our mission is to correct that!